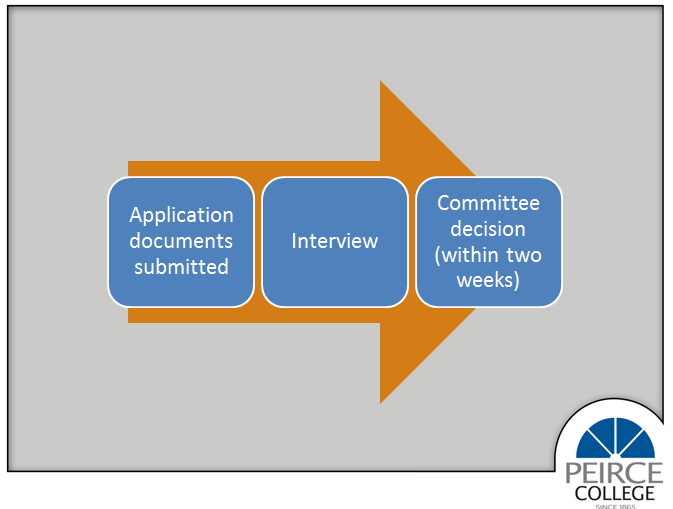 how to apply to a graduate program at Peirce. We recently hosted a graduate admissions seminar at Peirce to help current and prospective students navigate the graduate school application process. For those who weren’t able to make it to the event, I wanted to share some takeaways that might help you if you’re thinking about or are currently applying for admission to a graduate program at Peirce. Q: What do I need to apply to grad school? You can submit your application electronically to Masters@Peirce.edu or in hard copy to the Graduate Studies Admissions Office, Peirce College, 1420 Pine Street, Philadelphia, PA 19102. Q: How should I structure my resume? Statement of objective: This should be your ultimate goal. What do you want to achieve professionally and/or personally by completing a graduate program in your chosen field? Keep your objective short and well-written. Concise summary of qualifications: What makes you qualified for a master’s degree program? Highlight your GPA, related classes, extracurricular activities, and anything else that will make you stand out in the admissions process. Employment in reverse chronological order: Highlight your current or most recent position first with a few bullet points about your duties and responsibilities. Work your way backwards, including all relevant employment information. All completed education: Include any applicable two-year school, undergraduate, and graduate education that you’ve completed, including when you finished and your area of study. Q: What do you mean by official transcripts? What do I need to provide? A: At Peirce, we’re looking for the transcripts from all institutions you’ve attended – this includes two-year schools, undergraduate, and graduate. Your transcripts should be sent directly from the institution to Peirce. If you earned your bachelor’s degree at Peirce, we have your transcripts and will obtain them during your internal application review. Q: Who should complete my recommendation forms? A: Your recommendation forms should be completed by someone in a supervisory capacity. They can be someone who oversaw you in your education, such as a professor or academic advisor, or someone you know through your workplace, such as your boss or a senior colleague. Q: What should I discuss in the application essay for graduate school? We recommend that you keep your essay between one and two pages, and review your grammar, spelling, punctuation, logic, and coherence before submitting your application. Q: What will the interview be like? Your motivation for attending graduate school. Your academic qualifications, including your written and verbal communication skills, time management and study skills, and decision-making and problem-solving skills. Why you’re interested in a master’s degree in Organizational Leadership & Management. If you would need any personal and professional adjustments before starting the program. 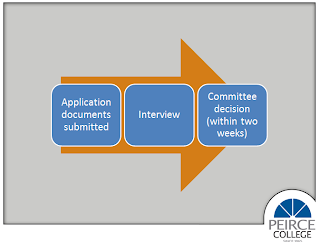 I hope this breakdown answered a few of your questions about the admissions process for Peirce’s Organizational Leadership & Management master’s degree program. But if you have more questions, leave them in a comment, and I’m happy to answer.